Approach cures human genetic disease in vitro Sunday, 31 May 2009 A study led by researchers at the Salk Institute for Biological Studies, has catapulted the field of regenerative medicine significantly forward, proving in principle that a human genetic disease can be cured using a combination of gene therapy and induced pluripotent stem (iPS) cell technology. The study, published in the May 31, 2009 early online edition of Nature, is a major milestone on the path from the laboratory to the clinic. 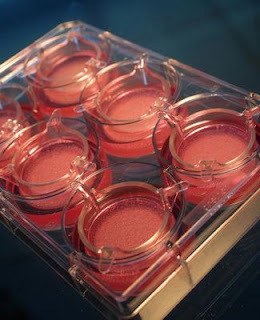 "It's been ten years since human stem cells were first cultured in a Petri dish," says the study's leader Juan-Carlos Izpisúa Belmonte, Ph.D., a professor in the Gene Expression Laboratory and director of the Center of Regenerative Medicine in Barcelona (CMRB), Spain. "The hope in the field has always been that we'll be able to correct a disease genetically and then make iPS cells that differentiate into the type of tissue where the disease is manifested and bring it to clinic." Although several studies have demonstrated the efficacy of the approach in mice, its feasibility in humans had not been established. The Salk study offers the first proof that this technology can work in human cells. Belmonte's team, working with Salk colleague Inder Verma, Ph.D., a professor in the Laboratory of Genetics, and colleagues at the CMRB, and the CIEMAT in Madrid, Spain, decided to focus on Fanconi anaemia (FA), a genetic disorder responsible for a series of haematological abnormalities that impair the body's ability to fight infection, deliver oxygen, and clot blood. Caused by mutations in one of 13 Fanconi anaemia (FA) genes, the disease often leads to bone marrow failure, leukaemia, and other cancers. Even after receiving bone marrow transplants to correct the haematological problems, patients remain at high risk of developing cancer and other serious health conditions. Shown in green are genetically-corrected fibroblasts from Fanconi anaemia patients are reprogrammed to generate induced pluripotent stem cells, which, in turn, can be differentiated into disease-free hematopoietic progenitors, capable of producing blood cells in vitro. Credit: Courtesy of Dr. Juan-Carlos Belmonte, Salk Institute for Biological Studies. 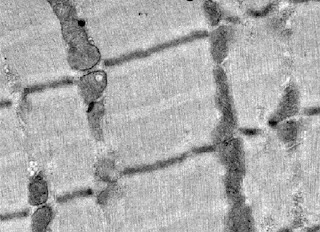 New study shows heart muscle protein can replace its missing skeletal muscle counterpart to give mice with myopathy a long and active life Tuesday, 26 May 2009 In a world first, West Australian scientists have cured mice of a devastating muscle disease that causes a Floppy Baby Syndrome – a breakthrough that could ultimately help thousands of families across the globe. A heart muscle protein can replace its missing skeletal muscle counterpart to give mice with myopathy a long and active life. The research, published online today in the Journal of Cell Biology, reveals how a team at the Western Australian Institute for Medical Research (WAIMR) has restored muscle function in mice with one type of Floppy Baby Syndrome – a congenital myopathy disorder that causes babies to be born without the ability to properly use their muscles. The currently incurable genetic diseases render most of the affected children severely paralysed and take the lives of the majority of these children before the age of one. The contraction machinery protein, actin, exists in different forms in the adult heart and skeletal muscles. The heart form, ACTC, is also the dominant form in skeletal muscle of the foetus. However, during development, the skeletal form, ACTA1, increases in production and by birth has taken over. It is not clear why the switch occurs, or why it does not occur in the heart, but it happens in every higher vertebrate and, for that reason, has been considered vitally important. Mutations to the ACTA1 gene cause a rare but serious myopathy. Most patients die within the first year of life and some are born almost completely paralyzed. Mice lacking ACTA1 die nine days after birth. Dr Kristen Nowak, lead author on the publication, wondered if ACTC could compensate for a lack of ACTA1. The two proteins differ only slightly but, like the developmental switch in production, this difference is conserved across species. Many researchers therefore assumed such compensation would never work. Muscle cell architecture looks normal in transgenic mice that lack ACTA1 but express human ACTC. Credit: Nowak, K.J., et al. 2009. J. Cell Biol. doi:10.1083/jcb.200812132. University of Oregon biochemists report a mechanism dictating cell division is not a long cascade of events Thursday, 14 May 2009 Driving Miranda, a protein in fruit flies crucial to switch a stem cell's fate, is not as complex as biologists thought, according to University of Oregon biochemists. They've found that one enzyme (aPKC or atypical protein kinase C) stands alone and acts as a traffic cop that directs which roads daughter cells will take. "Wherever aPKC is at or on a cell's cortex or membrane, Miranda isn't," says Kenneth E. Prehoda, a professor in the chemistry department and member of the UO's Institute of Molecular Biology. 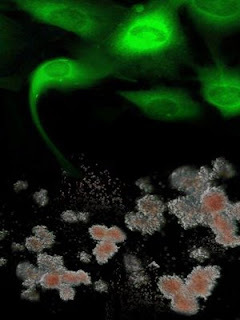 When a stem cell duplicates into daughter cells, the side, or cortical domain, containing aPKC continues as a stem cell, while the other domain with Miranda becomes a differentiated cell such as a neuron that forms the central nervous system. 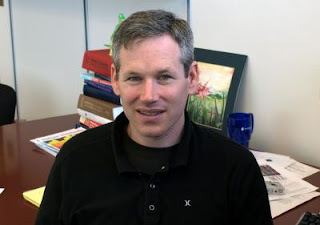 Prehoda and co-author Scott X. Atwood, who studied in Prehoda's lab and recently earned his doctorate, describe how the mechanism works in the May 12 issue of the journal Current Biology. Instead of a complex cascade of protein deactivation steps that many biologists have theorized, Prehoda said, aPKC strips phosphate off an energy-transfer nucleotide known as ATP and then attaches it to Miranda. This process forces Miranda away from aPKC and helps determine the fates of subsequent daughter cells. "This process is pretty simple," he said, when viewed from a biochemical perspective. 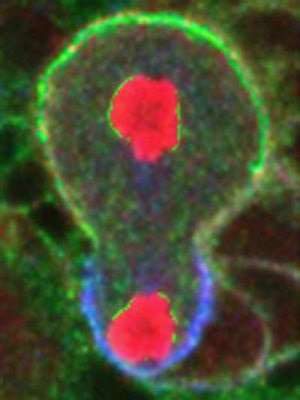 "What happens is that Miranda gets phosphorylated by aPKC, turning it into an inactivated substrate and pushing it into another location in the cell." Dividing Drosophila neuroblast. aPKC is shown in green at the top half of a fruit fly neuroblast. Miranda, in blue, has been driven away to the opposite side. Upon division, the top half will remain a stem cell, while the bottom will become a differentiated cell. Credit: Courtesy of Kenneth Prehoda. The data so far is very consistent with what researchers would expect to find in the early stages of a pandemic. The researchers' best estimate is that in Mexico, influenza A (H1N1) is fatal in around 4 in 1,000 cases, which would make this strain of influenza as lethal as the one found in the 1957 pandemic. The researchers stress that healthcare has greatly improved in most countries since 1957 and the world is now better prepared. The epidemic of influenza A (H1N1) is thought to have started in Mexico on 15 February 2009. The data suggests that by the end of April, around 23,000 people were infected with the virus in Mexico and 91 of these died as a result of infection. However, the figures are uncertain – for example, some mild cases may have gone unreported. The numbers infected could be as low as 6,000 people or as high as 32,000 people. The uncertainty around the numbers of people who have been infected with influenza A (H1N1) in Mexico means that the case fatality ratio (CFR) of 0.4% (4 deaths per 1000) cannot be definitely established. The CFR is in the range of 0.3% to 1.5%, but at this stage the researchers believe that 0.4% is the most likely. For every person infected, it is likely that there will be between 1.2 and 1.6 secondary cases. This is high compared to normal seasonal influenza, where around 10-15 percent of the population are likely to become infected. However, it is lower than would be expected for pandemic influenza, where 20-30 percent of the population are likely to become infected. In an outbreak in an isolated village called La Gloria, Mexico, children were twice as likely to become infected as adults, with 61% of those aged under 15 becoming infected, compared with 29% of those over 15. This may suggest that adults have some degree of immunity against infection, because of having been previously infected with a related strain of influenza, or it may mean that children are more susceptible to infection because they interact much more closely together, for example in school, than adults.